The 5 series' downward sloping hood and rear gives it a silhouette more typical of a coupe. BMW has made its 5 series lighter, more economical and fully connected with advanced technology first introduced in its 7-series flagship. The automaker expects the changes to advance sales of its second most popular model after the 3 series. The 5 series is aimed primarily at business customers who drive long distances and the model line accounts for 17 percent of the BMW brand's overall volumes. Since the current version was introduced in 2010 about 1.9 million units have been sold, including the Touring wagon, Gran Turismo and its Chinese long-wheelbase derivatives. China is the car's biggest market. The 5 series uses BMW's new Cluster Architecture (CLAR) introduced on the 7 series. It is now lighter and the outer shell is made almost entirely of aluminum, helping to reduce weight by 100kg. Power and efficiency have been improved, with the 540i gaining 10 percent higher output despite 11 percent less fuel consumption. Safety features include warnings if you are about to enter the highway in the wrong direction or are approaching cross-traffic or when failing to yield to priority traffic. The 5 series also offers a new start-stop function that uses specific route and traffic conditions to judge when to turn off the engine to save fuel. BMW freshened the styling by adding a second, slanted shoulder line on the side that ends by tracing the outline of its signature "Hofmeister Knick" on the C-pillar. Responding to current fashion, BMW also gave the car a downward sloping hood and rear to lend it a silhouette more typical of a coupe than a three-box sedan. Johann Kistler, the 5-series project chief, said the changes are more evolutionary in nature to protect the residual values of the model that is being replaced. The car's interior gets a major improvement: By no longer integrating the touchscreen display directly into the middle console, designers were able to lower the dashboard significantly. Not only does it look cleaner, lighter and more stylish, it also improves road visibility. The 5 series needs a boost in Europe and the U.S. In Europe its ranked third in the large premium car segment with 10-month sales of 67,020, according to JATO Dynamics, putting it behind the segment-leading Mercedes-Benz E class (82,318 sales) and the Audi A6 (80,205). In the U.S., the 5 series was No. 2 in the segment with a volume of 29,167 units, leaving it well behind Mercedes' sector-topping E class, which had 10-month sales of 37,599 units. Technology: Like the 7 series, the 5 series offers remote control parking and gesture recognition. It also has a lane-change assistant that works autonomously when road conditions allow. Engines: In Europe, there will be a choice of seven engines, with four, six and eight cylinders on offer. The variants include the 455-hp M550i xDrive and a plug-in hybrid with an electric range of 50 km. Connectivity: The 10.25-inch touch-screen uses the new BMW Connected Onboard with a personalized screen for each driver. It shows real-time information such as appointment times, traffic warnings and the weather at the destination. What's good: Relaxing interior; large selection of engines that arrived soon after launch; head-up display now 70 percent larger. 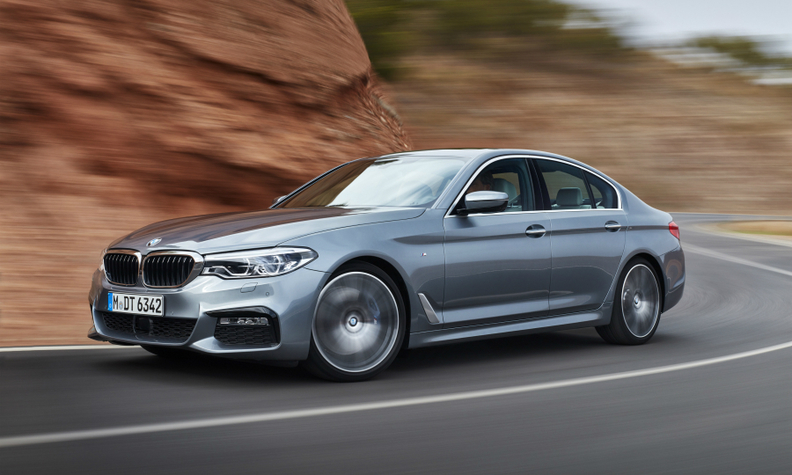 What's bad: New design elements so subtle the new 5 series could pass for a mid-cycle face-lift.